While a plethora of garden-grown zucchini is not always a welcome phenomenon for the talented gardener charged with finding a home for them all, a bumper crop of tomatoes never goes begging. Good tomatoes from the supermarket are as rare as hen’s teeth. Those who do not possess the green thumb must either go without the summer treat of a “real tomato” from the garden or be on good terms with one who has the gardening gift. If you are one of those individuals who possesses this happy talent, we who do not wish for you, as well, the blessing of a generous spirit. 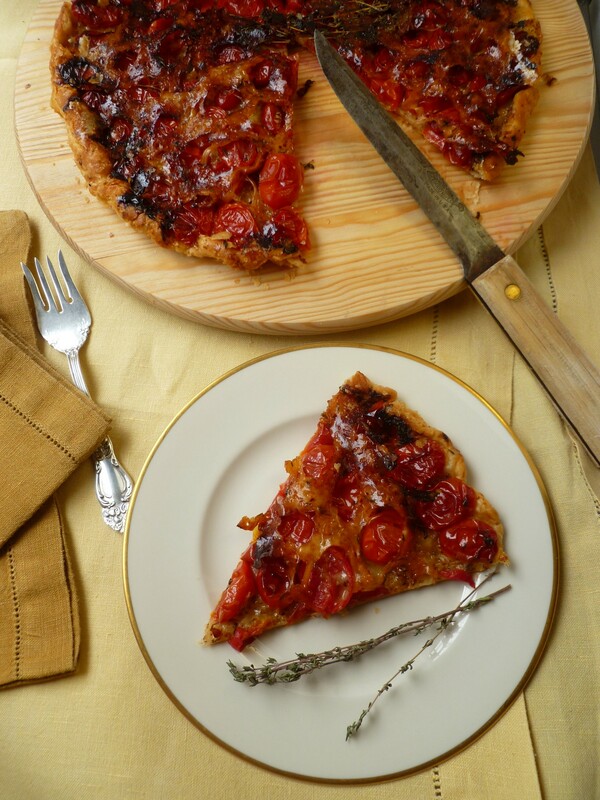 Timing Note: The tart may be made and served warm, or made several hours in advance and served at room temperature. Ingredients: Metric measuring equivalents are given in parentheses. 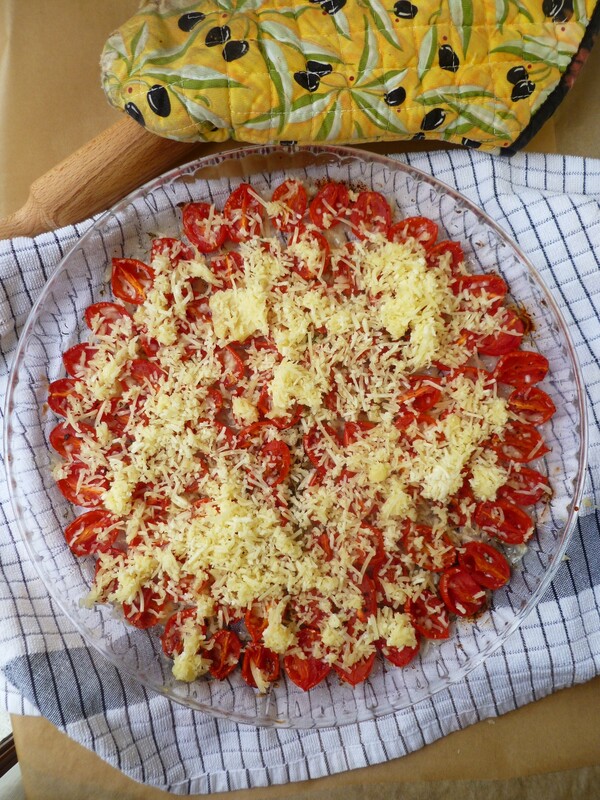 about 50 Romanita Tomatoes (about 500 g)…Cherry tomatoes are a perfectly good substitute. a round of Puff Pastry big enough to fit over the top of a tart pan that measures 11 and 1/2 inches across the top (34 cm): The refrigerated variety is better than the frozen. If rounds are not available where you live, rectangular sheets are fine and may be rolled out and cut to fit the tart pan. Optional: a sprig of fresh Thyme for the middle of the tart and sprigs of fresh or dried thyme to garnish individual servings. a Tart Pan: The one used for the photographed tart has a base of 11-inches (28 cm), a 1-inch depth (3 cm), and measures a bit larger across the top than the base…11 and 1/2 inches (34 cm). Straight-sided tart pans of other dimensions will work, too. 1. Preheat the oven to 350 F (180 C). 2. Brush the bottom and sides of the tart pan well with olive oil. Cut the tomatoes in half, lengthwise and with a small knife or your fingers scoop out the juice and seeds. 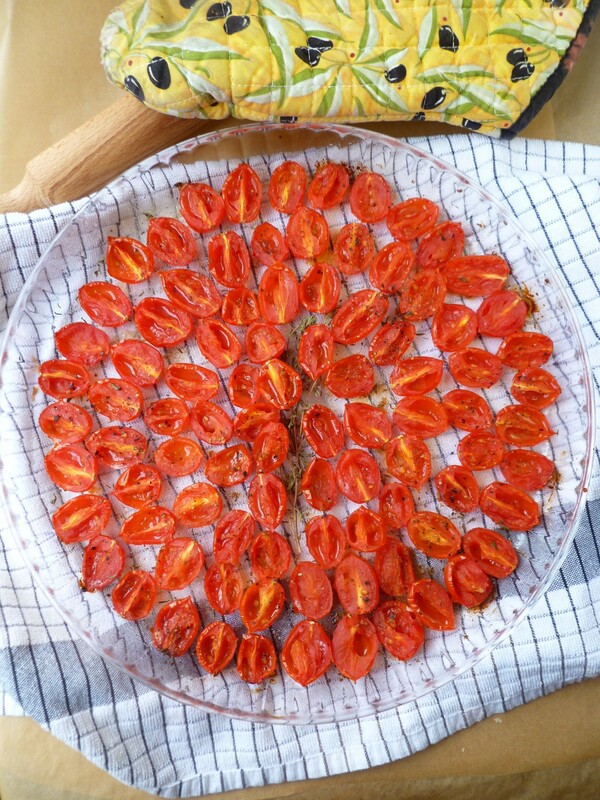 Place the tomato halves in a bowl; discard the juice and seeds…or freeze them to add to a soup or stock later. 3. Place the tomatoes, uncut side down (i.e. rounded side down) in concentric circles in the bottom of the pan. Place a branch of fresh thyme in the middle of the bottom of the pan if you like. 4. 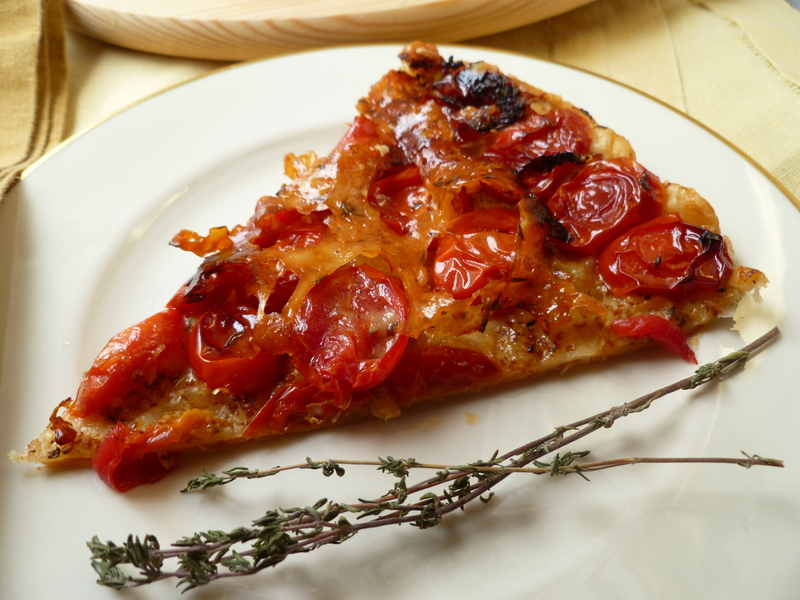 Drizzle the tomatoes with olive oil and liberally grind black pepper and salt over them. Sprinkle them with thyme leaves. 5. 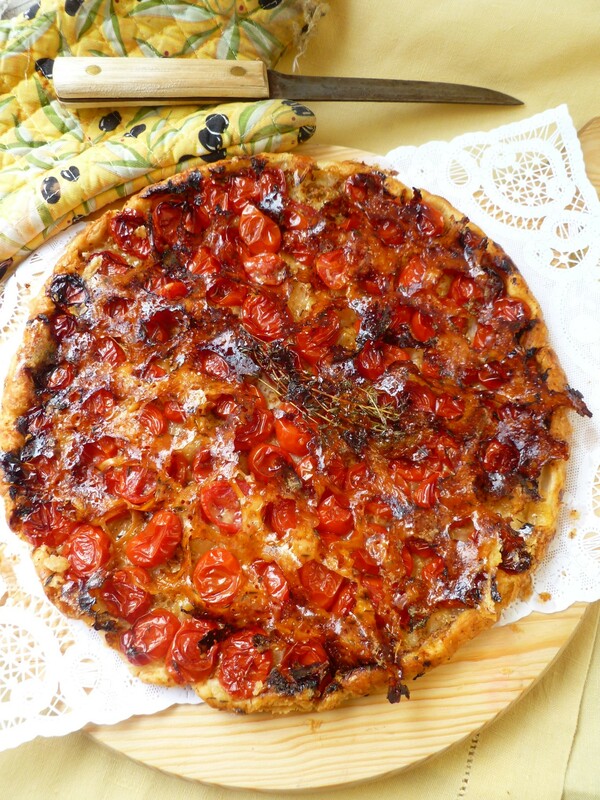 Place the tomatoes in the oven and cook them for 30 minutes. Remove them from the oven and use a spoon to drain off the juice rendered by the tomatoes during cooking. Do not turn off the oven…leave it at 350 F (180 C). 7. 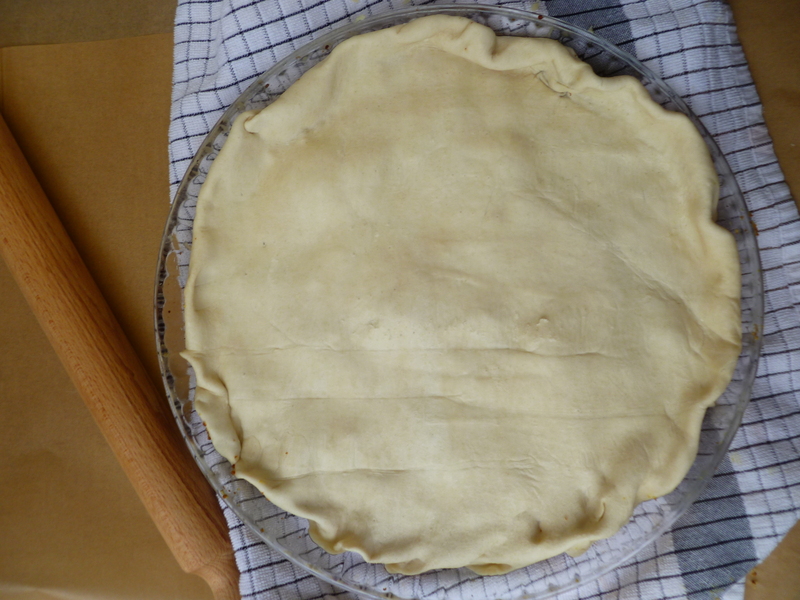 Roll out the round of puff pastry a bit, if necessary, to fit over the top of the tart pan with a small overhang. 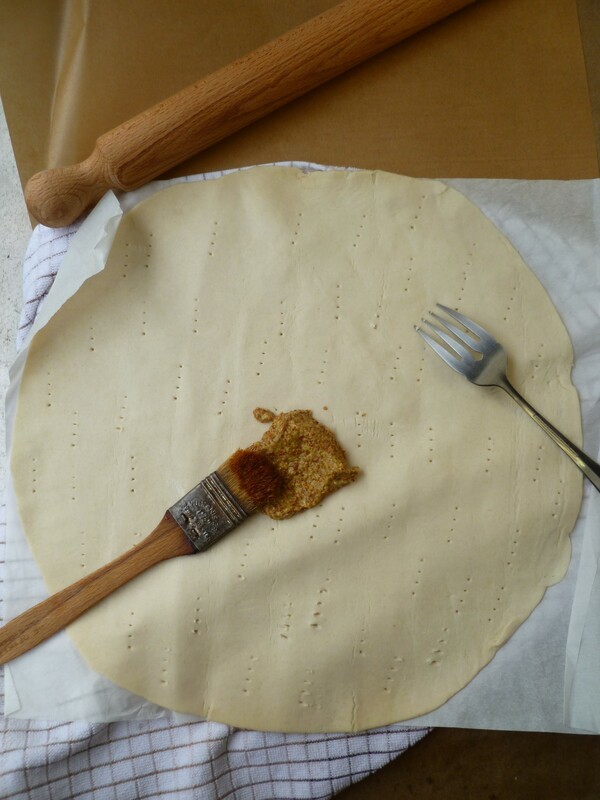 If using a rectangular sheet of pastry, roll it out and cut it to fit across the top of the tart pan. Prick the pastry with a fork and brush it all over on the top side with the mustard. 8. 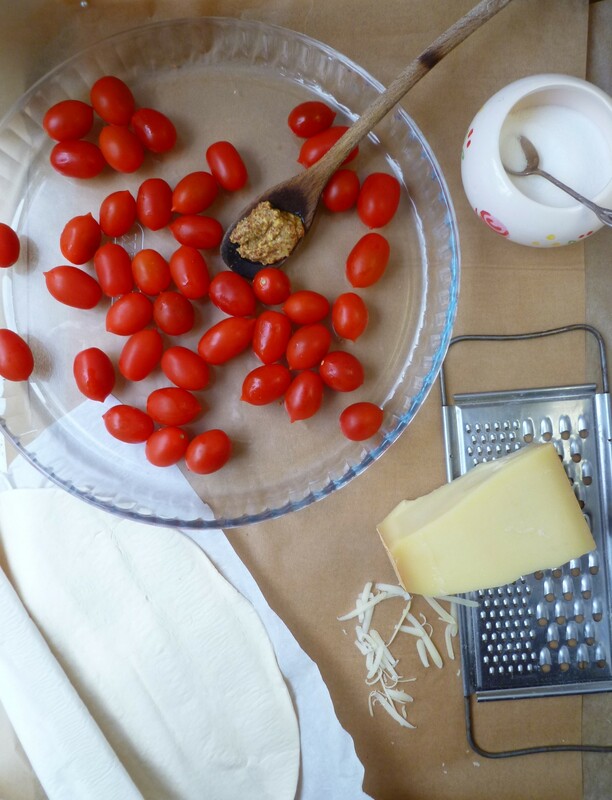 Cover the tomatoes with the pastry (mustard-brushed side down on top of the cheese). 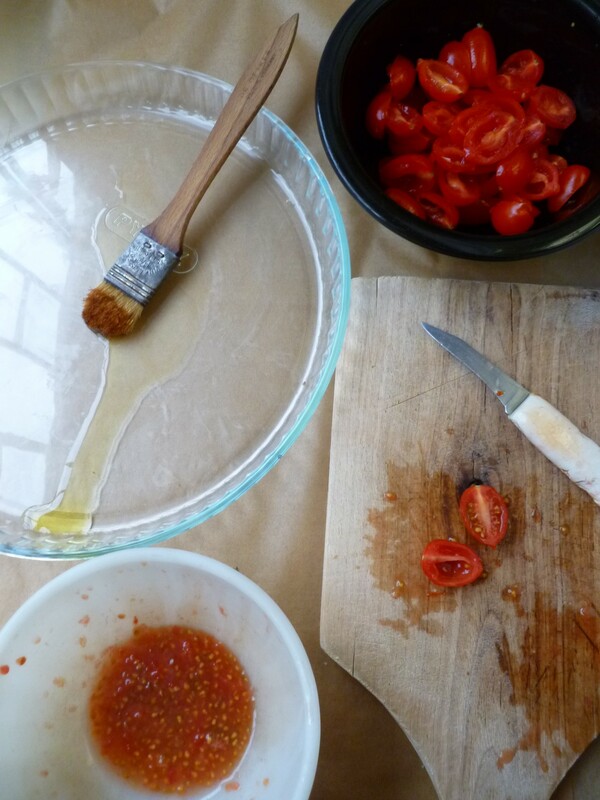 Tuck the edges of the pastry down around the sides of the tart pan to enclose the tomatoes within a bit. 9. Bake the tart for 25 minutes. Remove it from the oven and sit it on a cooling rack for 10 minutes. To unmould the tart onto the serving platter, gently loosen it from the sides of the tart pan and the outer edges of its base with a flat metal spatula. Turn the tart pan upside down onto the platter and lift it off the tart. 10. 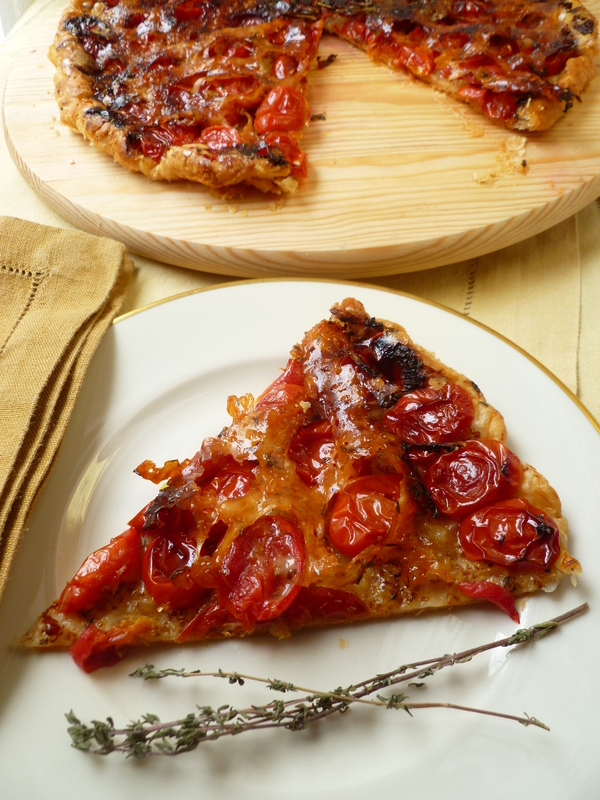 Cut the tart in slices and serve it warm or leave it to come to room temperature, cut and serve. 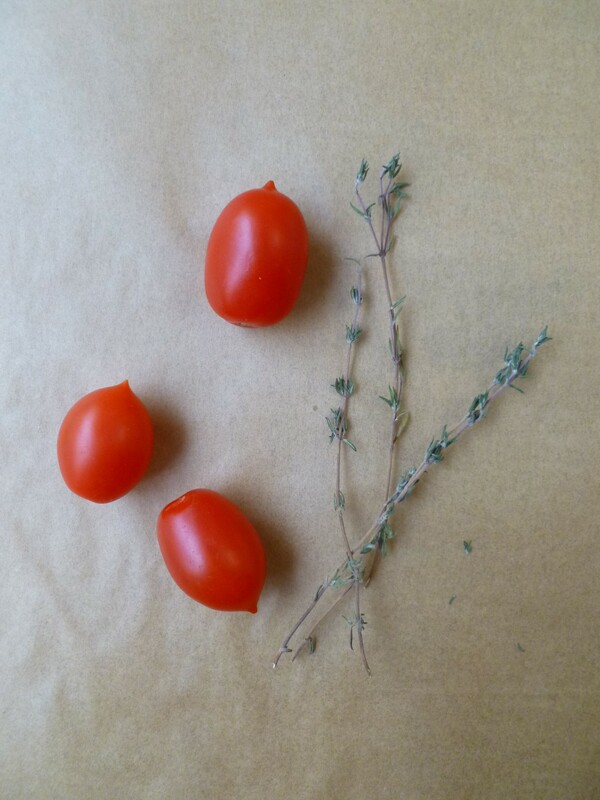 Garnish with short branches of fresh or dried thyme if you have them and feel so inclined. 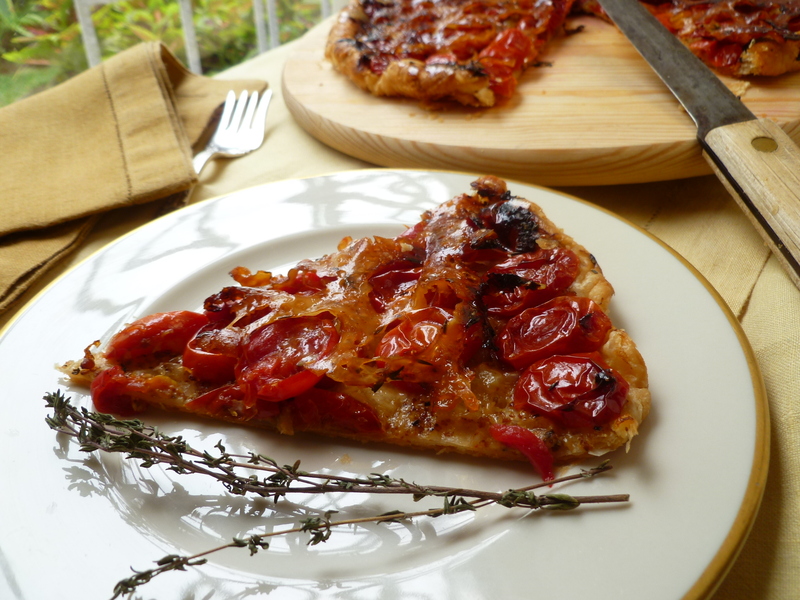 A Note: Tatin de Tomate is served as an hors d’oeuvre in the Dinner Menu: Surf and Turf Chez Laeuchli. It also will travel well to a picnic, or serve as a First Course or as a part of a Light Lunch with a salad and/or soup. 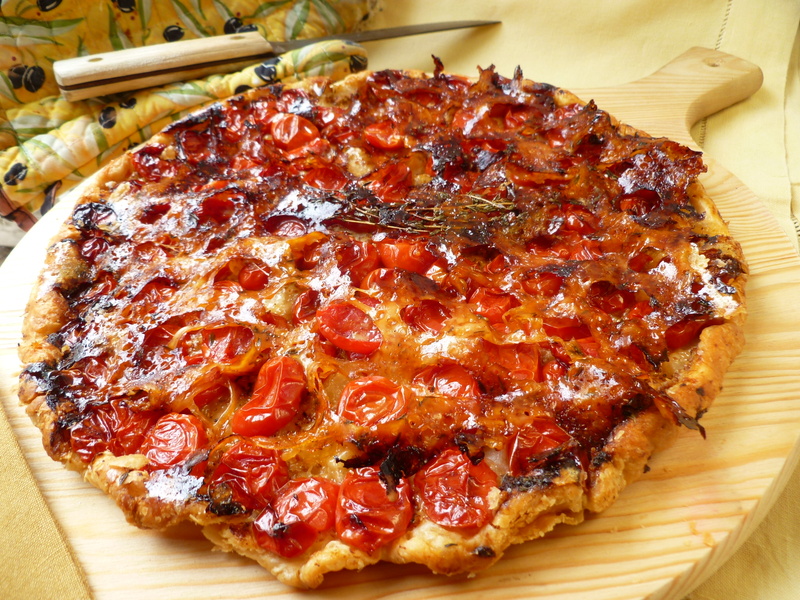 The recipe is adapted from one that appeared in the French cooking journal Cuisine Actuelle (hors-serie, Septembre/Octobre 2012).